After a long absence, I finally had some time to put the finishing touches on the balance and functionality of this rather arduous section of the codex, and then put the pen to the paper... or in this case, the mouse to the photoshop! 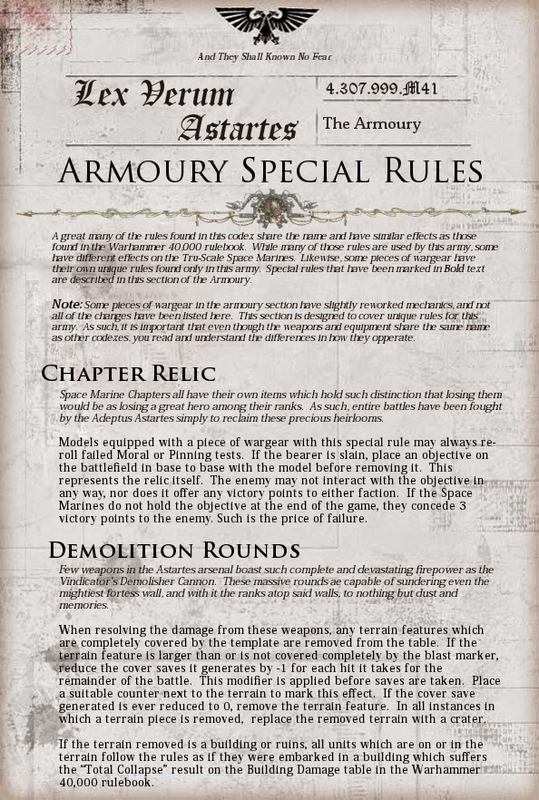 Finally I have rounded out the Armoury section for the codex, and with it, there was quite a bit left to cover. 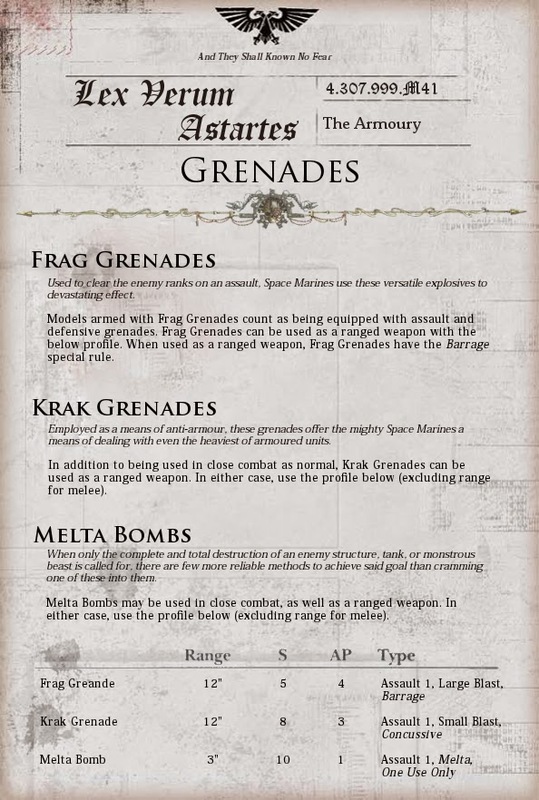 From minor elements many of us take for granted, such as grenades, to the intricate details of the numerous weapons and wargear, it's all here. If you have time to read it all, it was a labor of love. 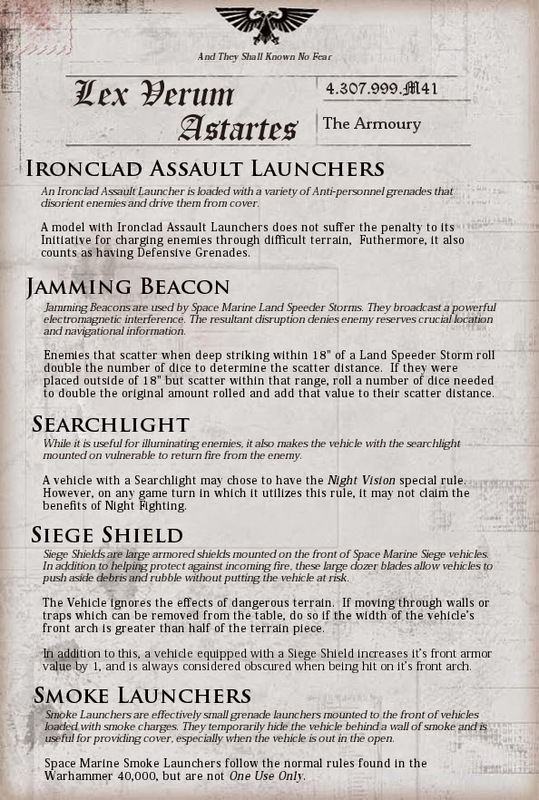 Most of the items in the codex work slightly differently than what we expect when we read names like Storm Shield or Power Weapons. 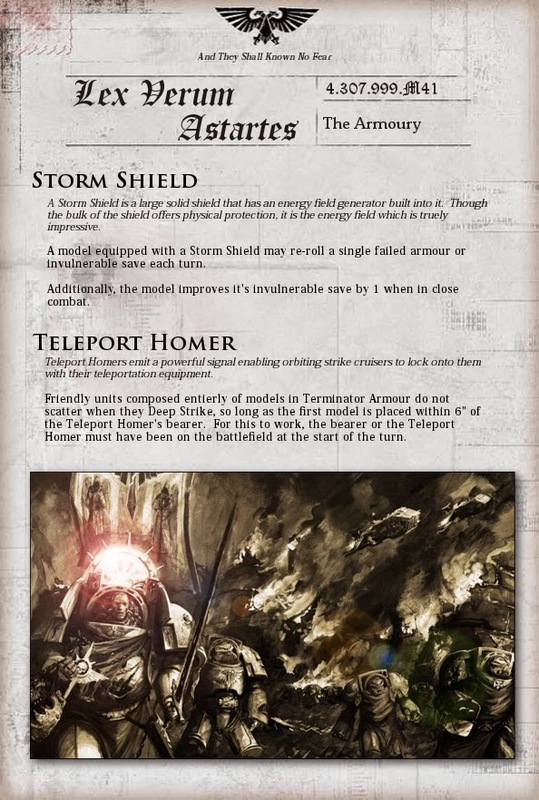 Things range from slight tweaks to major re-works based on the power level I think would keep the super charged Tru-Scale Marines in check. 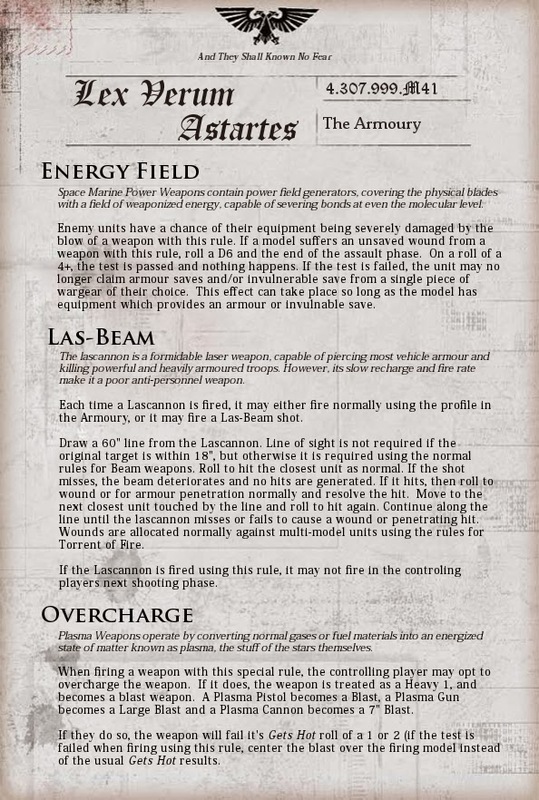 The most fun was the final section which hits the unique special rules to the codex. 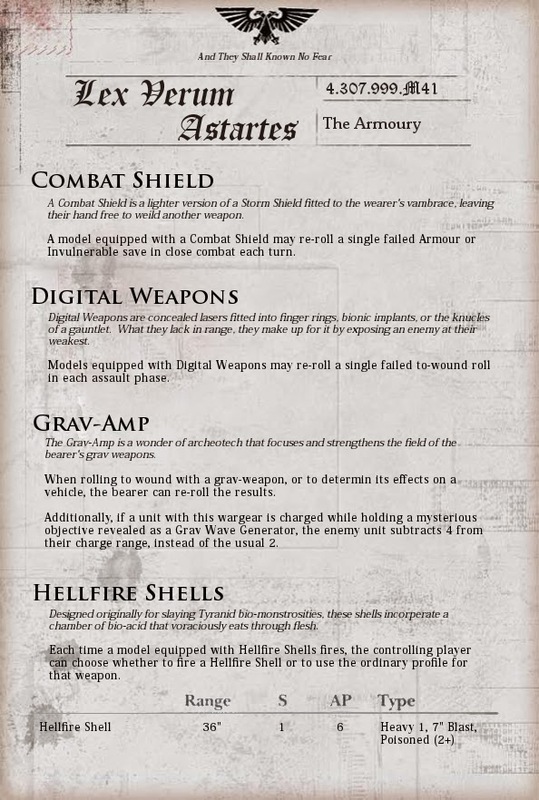 Some of them are pretty straightforward ports of rules found in the standard codex, with some tweaks to numbers here and there. But I needed them here in order to keep the codex self-sufficient (no lazy "Consult Codex: Adeptus Astartes" here. It's all spelled out for you, or is covered in the BRB). 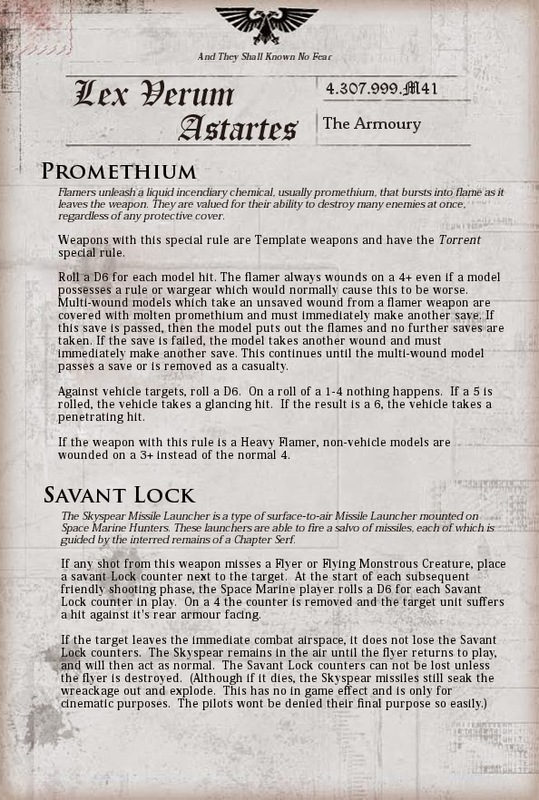 The rules unique to this codex were fun, and should add some added weight to these guys, making them a real challenge, even with their extremely low model count. In any event, here's the finishing touches to the Tru-Scale Armoury! You may notice I have tweaked some of the format, such as title fonts. 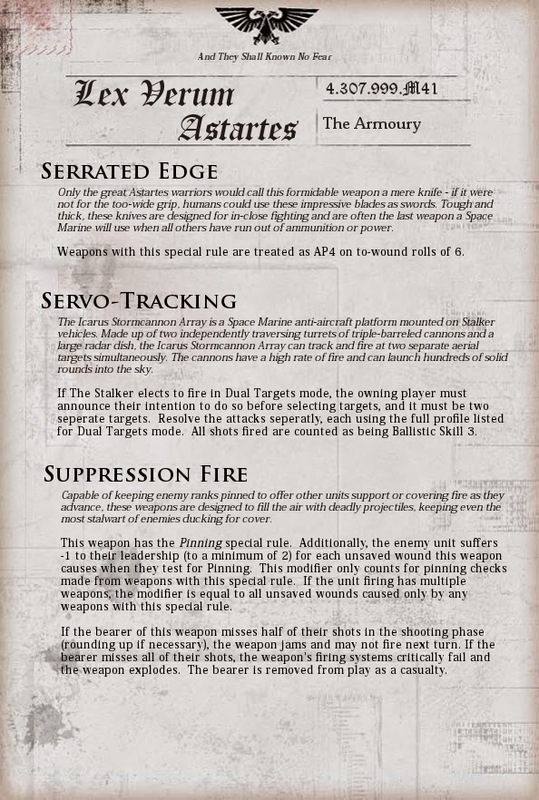 This should make the codex easier to read, while still having some nice aesthetics. So there you have it. As you may have noticed, the Relics common to most codexes these days have not been added. This will be it's own section later on that I will get to once I've had some time to balance out the rules. 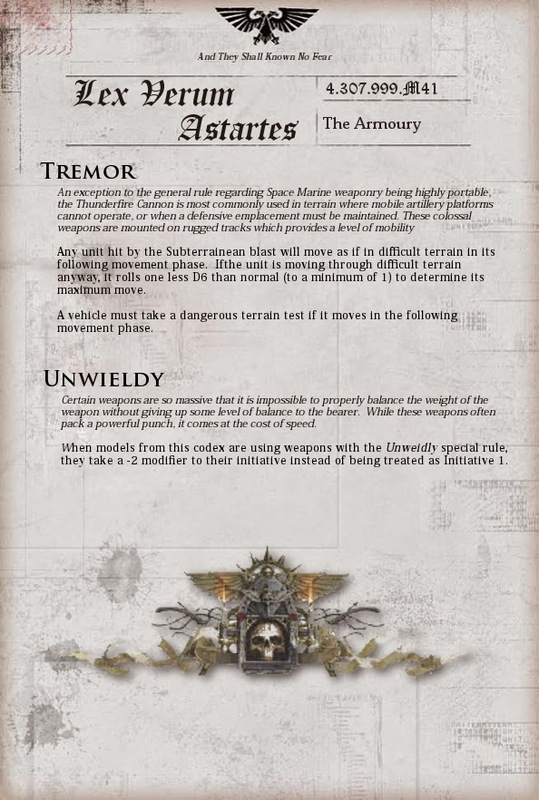 Things like "The Shield Eternal" or "The Teeth of Terra" will not be used, as this codex deserves to have it's own relics. 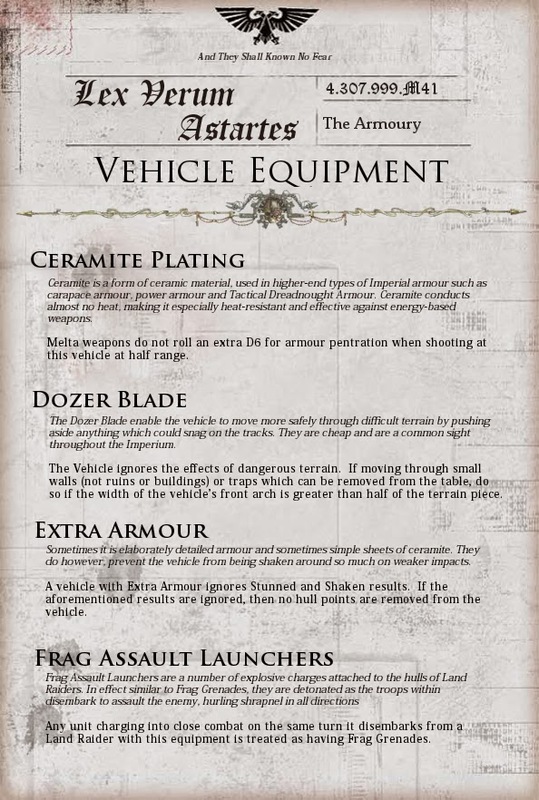 That said, I do not intend them to be uber items that are must have items, and some may even have Chapter Specific restrictions. 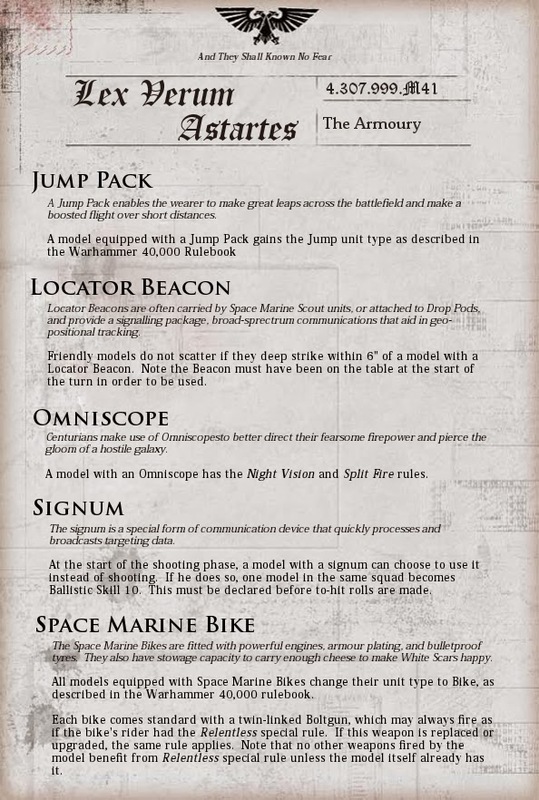 That said, they'll be fun to consider, and add some fun flavor to the codex, without spoiling the potential for players. 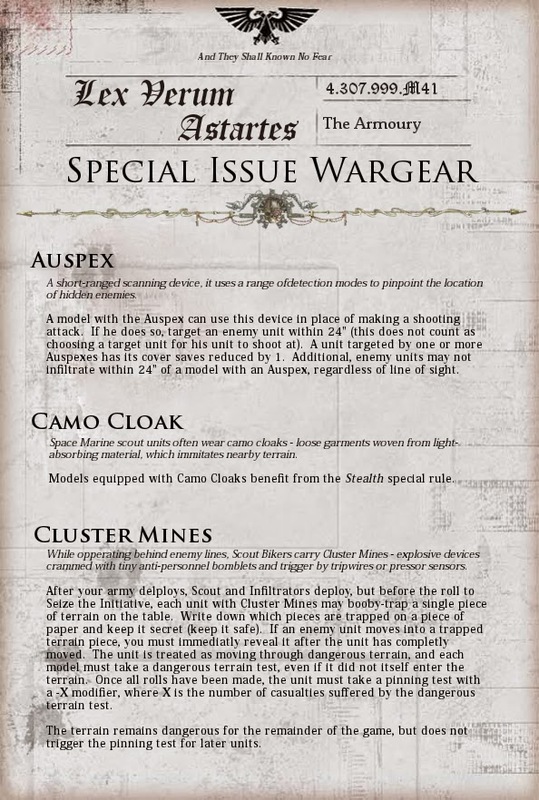 So this means the only things left are Relics, Unit Entries, and of course the Hobby section (which will include a step by step tutorial of how I have constructed my Tru-Scale marines. I have already started work on building a squad to get started, and to the right, is a picture of my first "Proof of Concept" model. My biggest challenge is really figuring out which chapter I want to make them. 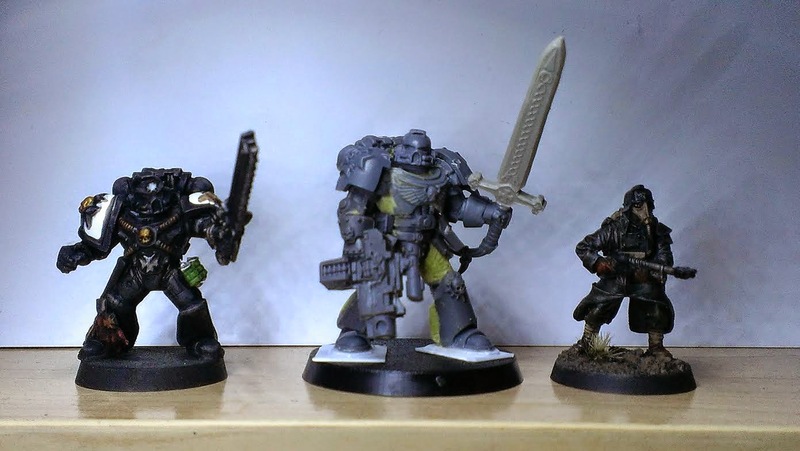 I wrestle with wanted to make them Black Templar, but having played the army, My mind makes me thing I should try something new an different. But I cant shake my love for the Men in Black. If you have any recommendations, I'd love to hear them. I've had a few folks try to get me to go to The Imperial Fists, given my loyalty to Dorn, but yellow ranks right up there with some of my least favorite colors. Should I get over it, or are there other options I should consider more? So if you have any suggestions, I'd love to hear them. Hope you guys enjoyed this long, albeit overdue addition to the series. See you next time!